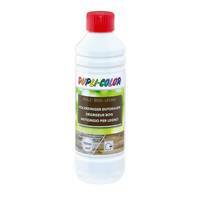 DUPLI-COLOR Wood Cleaner Anti-Grey is a ready-to-use cleaning agent for all greyed woods. Free from solvents and preserving agents. Exemplary uses are chairs, benches, tables, fences, palisades, pergola, wooden decks, teraces, wooden facades, all woods that turned into grey from weather. The drying time depends on surrounding temperature, air humidity and absorpitivity of the wooden ground. Remove rough and loose dirt. Wet the wooden area you wish to work on. Cover generously areas which shall not be treated, especially metals or plants, for example with painters foil. Apply the Wood Cleaner richly with a sponge or a cloth and brush it in with a hard brush in direction of the fiber. After 15 minutes of reaction time remove the solved greying by using a hard brush or a non-woven web (no steel-wool) and plenty of water in direction of the fiber. Thoroughly let dry (at least 2 days during dry and warm weather). We recommend to protect the wood afterwards with a DUPLI-COLOR Wood Lasure.